The URPOWER Motion Sensor Light is the second product sold by URPOWER that we have on the list. Like the Solar Spotlight we reviewed, this one also holds a 4.4 star rating on Amazon. It also is the #1 Best Seller in the Step Lights category. URPOWER seems to make pretty good quality products, with minimal issues surrounding them. Let's see if the URPOWER Motion Sensor Light holds up to the standards. Just by looking at the URPOWER motion sensor light, they seem larger than others we have reviewed. And in fact, this is a bit true. They size at 125 x 96 x 50 mm. That is 3.7 inches wide. The difference from a lot of other motion lights is how far this one sticks out from the wall. To add more lights and make the solar panel larger, they had to extend the front of the lights, making them protrude more from the wall. If you have these above a door or high on a wall, there should be no problem. However, if you have these lower for lighting up steps, the protrusion may be problematic. As for light, these fixtures include 8 LEDs. Unfortunately, they do not offer any information on how many lumens these lights emit. However, various customer reviews have said that they are very bright. But without any information, it is hard to be certain. But if they follow the technology as their other products, each LED should give 50 lumens. Putting the URPOWER motion sensor light at 400 lumens. That certainly is very bright. Beyond that, the battery included is a 3.7V with a capacity of 900mAh. Even though the fixture only includes 8 LEDs, that is still a rather small battery compared to others we have seen. Though, given that they focus more on motion sensing than staying on all throughout the night, it makes sense. The lights only remain on for 30 seconds after motion is detected. 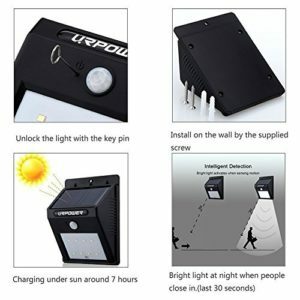 Another piece of information that this company failed to include about the URPOWER motion sensor light was the solar panels. The only information provided is that the lights only require about 6-8 hours of sunlight to charge completely. Again, given that these are purely motion sensor lights, the conversion rate of the solar panel means very little. However, it still would be nice to have that information handy. The body is something they give plenty of information for. It is made of sturdy plastic, which is also heatproof and waterproof, with a rating of IP64, which is very standard for many outdoor lights. However, it is still made out of plastic, so personally I would not go throwing this thing around. Be sure that it is securely screwed into the wall, without any looseness. Oh, and yes the screws are included in the package. When looking at the features, the biggest selling point is the fact that they have a motion sensor as its sole function. There is no dim setting or always on setting. Their default and only setting is the motion sensor comes online when the sun sets and turns off at sunrise. The motion sensor is very basic. It senses motion within 10 feet and at a range of 120 degrees. Nothing super special, but nothing bad either. The company URPOWER is actually only the manufacturer. They specialize in making appliances for home and garden, consumer electronics like speakers, and even pet supplies. They sell their products through authorized sellers. On Amazon, that seller goes by the name COCO-VISION. They nearly entirely deal in URPOWER products and have a 99% approval rating overall. In fact, in the last 90 days, they have had nothing but positive reviews. And they have been selling like crazy as well. URPOWER is based out of Shenzhen, China, which is no surprise as most tech companies operate out of China. The URPOWER Motion Sensor Light will last throughout whatever weather it is in. With its IP64 waterproof rating and the fact that it is heatproof, it should handle most situations pretty well. Which is to be expected from an outdoor solar light. It does one thing and does it very well. With the sole focus on motion sensing, it can achieve its goal perfectly and without any issues. If these lights include the same LEDs as URPOWER's other products, that should mean these motion sensor lights give out 400 lumens. 400 lumens is a great brightness, especially for motion sensor lights. The motion sensor is very capable. Even though it is nothing super special, it does what it is made to do very well. And at the end of the day, that is really all we can ask for. If the lumen output is truly 400 lumens, the 900mAh battery is very small for that. Even though the lights only stay on for 30 seconds after motion is sensed, still would be nice to see a larger battery. There is no information about the solar panels. So, it is impossible to know how efficient they are at absorbing sunlight. All we have to go off of is the 12 hour active time quoted by the company. But given that the lights only stay on for 30 seconds at a time, it is of little importance. The lightweight build does make it vulnerable to fall damage. Be certain the lights are securely fastened to the wall. While it does it's one function very well, there are no other lighting settings. These are purely motion sensor lights and that is all. Do not expect these to be on all night. With little information about the technology offered for the URPOWER Motion Sensor Light, all we have to go off of are the other URPOWER products we have reviewed. However, if these really do follow the same quality of their other products, these are pretty good lights. Great brightness, good at doing their one job, and will survive the elements. If you are looking for a great security fixture, these could be the ones for you. Supposedly, the URPOWER Motion Sensor Light is a decent light. Purely meant for motion sensing functions like an added security measure. But they do that pretty well. Right now, they are on sale for $32.99 on Amazon. Originally, they are $69.99. So if you really want them, better pick them up before the sale ends. And who knows when that will be. In addition, you also get 4 lights with each purchase. For more information regarding our other top 10 best outdoor solar lights, head on back to Green and Growing. Here are some top questions that I found for people seriously considering buying the URPOWER Motion Sensor Light. Do they need direct sunlight to get a solar charge? Due to the small battery, they can charge up to a decent level with only partial sunlight exposure. How can I install these lights? There are screws and anchors included in the package. Simply insert the screw through the hole at the top of the fixture and screw into a wall. How do you turn these on? There is a small pin included in the package. Insert it into the small hole on the front of the lights to turn them on for the first time. They will automatically become active once the sun sets.